It’s a little unbelievable that Cleveland just won a championship. This sounds sharp, but when you factor in that no team had brought home a title since 1964, and the current state of teams that don’t employ LeBron James, it wasn’t super farfetched to assume this day wouldn’t come for another decade or so. Especially when the last hurdle between Cleveland and victory was the two-time, unanimous MVP and his teammates that had the winningest regular season ever, only dropped back to back games twice, never lost three in a row with this coach, and were borderline unbeatable at home the last two years. This should have been, and roughly was, impossible. But today we got to wake up with a smile (unless you live in the Bay Area) as one of the most incredible sports moments this century has finally come to pass. LeBron James has brought a title home to Cleveland, after 13 years as a pro. This incredible journey, from Saint Vincent’s Saint Mary’s, to Cleveland-Miami-and-back, and to six consecutive finals have been unlike any other career in league history. And thanks to a three game stretch of basketball that goes beyond comprehension, LeBron’s career is forever changed. The only players that have won three titles, three Finals MVPs, and four regular season MVPs are Michael Jordan and LeBron James. But Michael never, ever had to face this daunting of a challenge. Because with all of the caveats listed above, no team had ever won after being down 3-1 in the Finals. Yet we are left with some of the most insane images in playoff basketball history. Specifically LeBron’s soon-to-be-career-defining-play, “The Block”. Then Kyrie Irving taking Steph Curry one-on-one and dropping this dagger of a three. Kevin Love denying the best shooter of all time a look to tie the game. 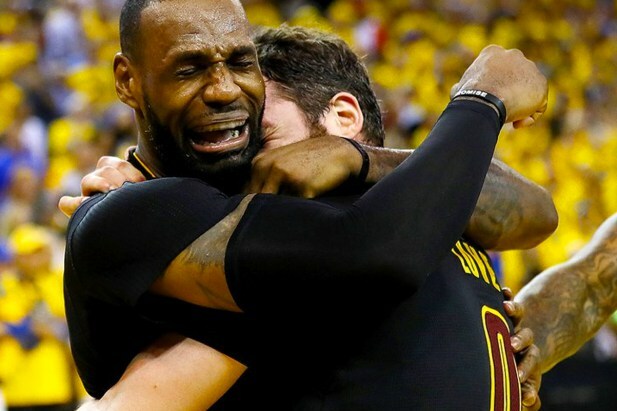 And finally what was allllllllmost the greatest Finals moment in history, with LeBron almost ending Draymond Green on a dunk that led to the Championship sealing free throws. And now we are left with LeBron James comfortably in the conversation with the absolute greatest players in history, Kyrie Irving comfortably the baddest man on the planet, Kevin Love comfortably gaining back the respect he had lost earlier this series, Steph Curry comfortably getting picked apart for disappearing down the stretch, Klay Thompson comfortably following suit with Steph, and Draymond Green comfortably having swung this series thanks to his suspension for targeting LeBron’s crotch. But most of all, we are left with an incredible Game 7, unbelievable NBA Finals, and a championship for Cleveland at long last. Now all we need is for the NBA Draft to return as fast as humanly possible, because this is perfect.